Over the years, common questions seem to arise that we’ve answered below. Select any topic and our response will appear below. If your question is not answered here, please contact us (click here). In three words, or less, what do you do? Proactive (1) Pond (2) Management (3). How’s that? Expanding a bit, we work with larger, private ponds (generally 1/10 acre and up). We write and implement management plans for our clients’ ponds using natural methods, with limited chemicals. We use a proven process to improve pond ecosystems and prevent the ponds from aging (new ponds) or reverse aging (existing ponds). Our clients expect a ‘swimming pool they can fish out of’ and we expect satisfied clients. How is your process proven? We take nothing for granted, which is why we test each pond initially and periodically. We develop a starting point (the current condition of your pond) and monitor progress, until we get the pond to the condition that was present when the pond was new. Even then, we continue to test to make sure the pond remains on the right track. This process allows you to see, through statistics, the improvement of your pond. Furthermore, this protocol provides us with valuable research information to continue improving our processes and products. What do you specifically sell, after the management plan is written? Aeration is the first step, so we sell aeration systems designed for your situation. After aeration, our base product is a microbial blend of bacteria and enzymes for naturally treating ponds. We use unique methods to dispense the natural bacteria into the water column. This is done in order to clean up organic sludge and to reduce nutrients, thereby improving the ecosystem of the body of water. We manufacture our own preventative microbial products and private label our own dye, thereby insuring quality raw materials, consistency in performance and quality, and price stability. We are distributors for several companies with complementary pond products and equipment. These companies work with us to find safe solutions for ponds. All of the products and equipment we sell are made in the U.S.A. Finally, we can be hired as a consultant for your pond construction, or reconstruction, project. I heard you sell pond bacteria. Can I stop by and pick some up for my pond? The short answer is ‘no’. The ‘why’ is important to understand. First, we only sell to clients. We are not a retail business. We take the time to write a management plan (we call it a prescription) for each of our clients’ ponds and invest time getting to know each unique situation and your goals. We then prescribe the products to match the pond’s needs. Second, we believe in treating the cause of the problem vs. the symptom. Buying products off a shelf, hoping for a ‘silver bullet’, doesn’t work for anything in life, including ponds. In summary, we want you to understand and become educated regarding proactive pond management. Our first step is to write a prescription for your pond. We realize this is not the fastest way to grow a business, but we’ve chosen to operate based on a proven methodology. What can we expect if we choose to become a client? You will get more than what you paid for. You will get treated as a client vs. a customer. We want a relationship that is mutually respectful vs. a transaction oriented approach. You will get timely responses and straight talk. You will be given fair, long-term prices and not nickeled and dimed. In short, you will get great, old school service – being treated like you want to be treated. We want you to be a client for life. Can I take care of my pond myself? Yes you can. Our management plans and products are designed with our clients in mind. We write the plan so it’s easy to follow; and our products are easy to apply. Can you take care of my pond for me? We offer this as a service to our clients. While most clients manage their own ponds, following the prescription, we are also full service and many clients take advantage of this opportunity. This ‘hands off’ approach allows you to simply enjoy the pond. We get involved as the consultant in many construction opportunities. We do so in situations where the client wants to manage their pond proactively, following our prescription, after the pond is constructed. We are often involved as a consultant on the front end. Constructing a pond properly is the single most important thing you can do to minimize future problems. My pond is an overgrown mess; can you help? Yes, we’ve consulted on many reconstruction ‘facelifts’ for clients and would enjoy the opportunity to show you our work. Click here to view some of our facelift projects. Why don’t you use copper based products? Our research and history with pond management has led us to three conclusions with regards to copper based products: a) Copper will bioaccumulate within your pond, leaving a ‘chemical footprint’; b) Over time, your pond will grow resistant to the copper based products, therefore rendering them ineffective for algae and weed treatments; c) Copper kills healthy bacteria. Now that you know this, if you would like to continue to add both bacteria and copper products, at the same time, you should just hand over the rest of your money - clearly you don’t have a problem wasting it! How do your healthy pond bacteria stack up in the marketplace? If you read ‘Our Story’ in the ABOUT tab of the website, you’ll understand we’ve gone to great lengths to develop our own proprietary blend of bacteria (click here). Safe for algae? No. Safe for swimming, fishing, recreational activities, animal use? Completely. Our main preventative products (Probiotic Spheres and Microbial Boost) can be added at any time, without restricting you from enjoying your pond. If we use a chemical in your pond, there will be label restrictions that must be followed. There is no such thing as a ‘safe’ chemical. That said, we don’t use bioaccumulating chemicals. None of the chemicals we use have restrictions related to swimming, fishing or animal consumption! Why are healthy bacteria so important? A proper blend and volume of bacteria will consume nutrients in the pond faster than the pond can produce them; thus, competing for the same food source that encourages algae growth. Without the bacteria, you get caught in a vicious cycle. As you kill off algae, you create more nutrients in the water, which encourages more algae growth, which keeps repeating itself. . . getting worse over time. More importantly, proper bacteria eliminate muck, thereby stopping and reversing a pond's aging process. What caused my fish to die? Defining a specific cause is difficult. These events rarely leave an obvious audit trail. However, some circumstances, or a combination of events, can lead to a fish kill. For example, killing off a large volume of weeds or algae too quickly in the pond, or not setting up the pond with proper aeration practices in summer and winter can result in fish kills. How can I prevent fish kill? Just as pinpointing the cause of a fish kill is difficult, completely preventing a fish kill is also difficult. Each pond is unique, so one size doesn’t fit all. However, you can take general steps to help limit the possibility of a fish kill. For example, proper aeration systems and practices (summer and winter), cooling the pond with well water during the dog days of summer, proper weed and algae management practices, and proper stocking practices will help mitigate a fish kill. Fish are sensitive to changes in the pond ecosystem. Can I have too many fish? Of course. Depending on the pond’s water volume, and other pond specific factors, there is a recommended capacity of fish in each pond. Fish are generally helpful in completing the food chain, given proper stocking rates. What is the importance of oxygen to the pond? We define aeration as the first, and most important, step of successful proactive pond management given how necessary oxygen is to the pond. Healthy bacteria, and fish, need the proper levels of dissolved oxygen to not only live, but thrive. How do I know if my aeration system is the right size for my pond? Have The Pond People® produce a prescription report and your current aeration system will be evaluated. Based on our measurements (surface area, depth, and acre feet), we will be able to determine whether or not your current aeration system is the right size, and is laid out properly, for your pond. Would it be advantageous to circulate the water more than my current aerator does? If you aeration system is properly sized and laid out, no. How do I kill weeds in my pond? It all depends on the type of weed in your pond. Weed identification is part of the prescription process, and it is also something we do for our clients at no additional charge. Once the weed is identified, then we can discuss treatment options and go forward with an agreed upon plan. Aquatic weeds have specific chemicals designed to kill them. Do not use landscape vegetation weed killers in your pond. How come weeds seem to keep coming back? Keeping weeds completely out of your pond forever is not possible. Various birds and animals can bring weed problems from another pond to your pond. However, if a weed continues to come back, then it is likely a perennial plant that has grown roots within the pond’s ecosystem. If a weed comes back, following a chemical treatment, then you have either failed to systemically eliminate the plant’s presence in the pond through the elimination of its roots, or the plant has been reintroduced to the pond. Can I rake/pull out the weeds instead of using a chemical? Yes and no. Mechanical control is fine for some types of weeds, but some weeds spread by fragmentation. In these cases, you are actually making things worse by raking or pulling out the weed. With these specific weeds, chemical control is your best option. What is the benefit of adding well water to my pond? What if my well water is high in iron? Well water is usually fresh, clean water and much cooler than the water in your pond. The addition of well water improves the quality of the water, in a properly aerated pond. The cooler water is also important to maintaining proper dissolved oxygen. As the temperature of a pond decreases, the easier it is to maintain the desired dissolved oxygen levels. Warmer water will struggle to hold good dissolved oxygen levels compared to cooler water. Iron in a pond is not a bad thing; iron can bind phosphates. However, high volumes of iron can cause issues. Fish, aquatic plants, and bacteria will struggle with high levels of iron. Methods to remove high iron from the well water need to be considered before introducing to the pond. Is rain water good for my pond? In general, yes. However, if it enters your pond due to runoff, it usually is picking up more negatives than positives on its way. Rain water is soft, and acidic, both of which usually benefit a pond. How fast does water evaporate from my pond? It depends on the weather. On the extreme end, you can lose two inches per day during the dog days of summer. My brother-in-law has a pond that never gets algae; why do I keep getting algae in my pond? Each pond has unique water quality and substrate combinations. We know of newly constructed ponds that developed algae almost immediately compared to 10 year old ponds that produce limited amounts of algae over the entire 10 year span. However, ponds that don’t produce any visible algae are very rare without any type of action by the pond owner. One thing to consider - a fish keeps getting bigger every time the story is told. Does Phycomycin/GreenClean PRO/PAK 27 kill weeds? These products are algae specific and have no effect on weed control. What is the benefit of blue dye to my pond? Blue dye helps limit the penetration of the sun’s UV rays into the pond water. What’s the big deal? Sunlight kills healthy bacteria, so adding dye is like insuring your investment in bacteria. The proper dosage and timing are important factors when introducing dye to a pond. What is the impact of leaves/debris blowing into my pond? Leaves/debris (grass clippings, animal waste, etc.) all collect in the pond to form the organic sludge we scientifically term as ‘muck’. The muck, as a collection of organic compounds, is where some of the fuel sources for algae are held. The more organic material that enters the pond, the more muck, and the more muck, the more algae will bloom in your pond. Our management plans are written to account for these situations. Is it okay for my pond to get algae? Yes; it wouldn’t be a pond if it didn’t! How can I improve water quality in my pond? Design opportunities — often, the original design did not take into account a factor that is negatively impacting the pond. For example, runoff from a neighboring pasture may be adding excessive nutrients to your pond. Our pond prescription process is designed to capture each situation that is negatively impacting your pond water quality. We can then provide recommendations consistent with your budget. Proper up-front design is the single most important factor in maintaining a healthy pond. Aeration — adding oxygen to your water increases the habitat for natural bacteria. 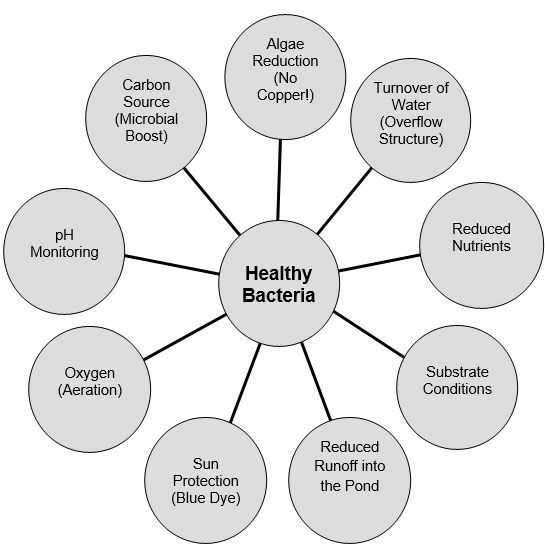 Natural bacteria eat the excess nutrients in the water and thus improve the ecosystem. Add rooted plants — water plants need nutrients in order to grow. Accordingly, adding these plants is a natural way to improve the ecosystem. Healthy vegetation also stabilizes the substrate and provides habit for insects and fish. Add fish — certain fish help the ecosystem by completing the food chain within the body of water. Add chemicals — there are several chemicals on the market that make all kinds of claims. These are generally short term solutions, because they do nothing to eliminate the source of the problem. While chemicals are the fastest method for providing a nice looking pond, they do nothing for long term control and can cause permanent damage. Additionally, adding chemicals to your water cannot have a positive impact on fish or humans! We do not recommend this “solution”. In selective situations, chemicals can be a method to gain control of a pond with severe needs. Please contact us before adding chemicals. Utilize ultrasonic technologies — please visit http://www.sonicsolutionsllc.com for a complete description of this process. How can I support the healthy bacteria in my pond? How do I prevent mosquitoes from breeding in my pond? One of the main characteristics of mosquito breeding is their desire for stagnant water. Introducing proper aeration, and keeping the pond in clean and healthy shape, will virtually eliminate the chances for mosquito populations. Can I prevent invasive species from entering my pond? Unfortunately, no. However, you can help mitigate the situation by limiting bird traffic (especially geese), cleaning equipment if used in another body of water, and making sure pets that use another body of water do not enter your pond before having a bath. What do I do if my ear gets clogged with water? See answer to the next question. What can be done to prevent swimmer's itch? Can you supply references of clients who have used your services? Yes. The products we manufacture and represent have been used successfully for years, so we have many references, available upon your request. Additionally, we have six ponds of our own that you can visit. Lastly, please see the 'Testimonials' section under the 'Clients' tab of the website. Can we contact you with questions regarding our pond? Yes. We welcome questions about your pond. We encourage you to submit your questions via the Contact Us tab of this website. You may also call us at (855) WOW-POND.